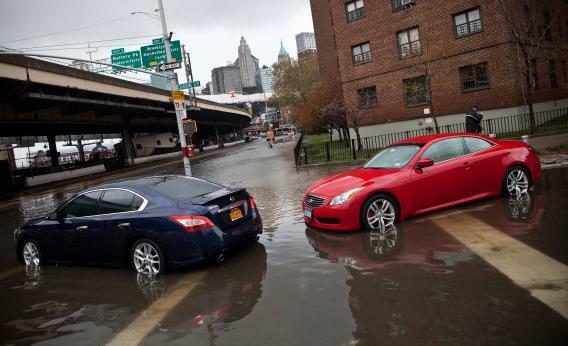 Sandy dents Wall Street but spares U.S. election. America’s “Frankenstorm” lived up to the hype. A record storm surge on Monday evening left train and car tunnels flooded, much of Lower Manhattan dark, and bank headquarters like those of Goldman Sachs running on backup power. The overall economic damage could run as high as $20 billion, according to risk modeler Eqecat, and that was before Hurricane Sandy completed her destruction. Luckily for American voters, the weather arrived a full week before the Nov. 6 elections. Up and down the Eastern seaboard, a total of 7 million people lost power. Flooding and transport trouble will add to the chaos. But just as Wall Street will be back at work, by next Tuesday it is likely most people who want to vote will be able to do so. In any event the swath of states affected by Sandy mostly lean heavily to President Barack Obama, so a few lingering access problems shouldn’t change the outcome. Pennsylvania could be an exception, but even there Obama was leading by a solid five percentage points over Republican challenger Mitt Romney in the latest roundup of polls by RealClearPolitics. Any meaningful effect on the last days of the very tight race for the White House will probably stem from the candidates’ perceived handling of the response. Obama might garner a publicity boost. For one thing, the storm has displaced the campaign in the headlines - and unlike Romney, part of the president’s job is to respond to the damage. More subtly, Obama is the candidate most associated with hands-on government. The advance warnings, fully justified in hindsight, together with the highly visible involvement of fire and police departments and other first responders might nudge a few undecided voters his way. Had warnings and preparations proved inadequate, of course, that would have been damaging for Obama as well as for officials like Chris Christie, the Republican New Jersey governor who praised Obama’s handling of the storm. It’s not all good for the president. He probably runs the greater risk in the coming days of turning off voters. Any sign of a slow or bungled federal response to the storm - the kind of things that went wrong for George W. Bush after the far more severe Hurricane Katrina flooded New Orleans in 2005 - could give Romney ammunition and damage Obama’s prospects across the country. Whatever happens, both men will need to avoid blatantly making political hay out of misfortune, and their best focus is probably on the efforts needed to get New York and the whole region running smoothly. The economic cost will be a distant memory within a few months. Barring major gaffes by the candidates, and despite the pundits’ efforts at spin, the political impact of the storm will probably be small, too.